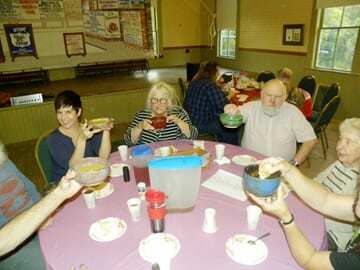 Last year’s Souper Supper guests enjoy soup in their Third Branch Pottery bowls. Nine local restaurants will be providing their specialty soups and homemade breads to the second annual Souper Supper, a joint fundraiser supporting the Randolph Area Food Shelf and the Brookfield Community Partnership. The supper is this weekend – Saturday, Sept. 26 at 6 p.m. at the Old Town Hall in the village of Brookfield. Diners have the option to purchase a handmade pottery bowl from which to eat their soup, and are encouraged to bring a non-perishable food donation for the Food Shelf. Participating restaurants include: One Main, Black Krim, Saap, Lyons’ Den, Chef’s Market, Ariel’s, Randolph Depot, Willy B’s at the Three Stallion, and 3 BeanCafe. Chef’s Market’s will be offering its signature Tomato, Three Cheese, Dill soup and Lyons’ Den brings back last year’s popular Corn Chowder with Salt Pork. There will be many other tempting and delightful soups, including vegetarian, vegan, gluten-free, and dairy-free options. Soup and bread will be followed by homemade desserts provided by area volunteers. Folks are welcome to BYOB. This event encourages us all to pay special attention to the fact that many of our neighbors have difficulty feeding their families and themselves three healthy meals each day. Sometimes that’s an occasional problem and for some it is a way of life. This is our opportunity to help fill their empty bowls by supporting our Randolph Area Food Shelf. For $25, diners get their choice of a handmade pottery bowl from Third Branch Pottery, plus dinner, dessert, and a beverage. For $10, diners get the same food and drink, minus the pottery bowl. Leftover soup, desserts, and bowls will be available for purchase at the end of the evening. Proceeds will be split between the Brookfield Community Partnership and the Randolph Area Food Shelf. All diners will be entered into a special drawing, with the winner bringing home a large serving bowl, also made and donated by Third Branch Pottery with the support of the Frankenburg Agency of Randolph. The summer series at the Old Town Hall is generously sponsored by the Frankenburg Agency of Randolph, with additional support for the Souper Supper by Century 21-Millstone Agency. The Randolph Area Food Shelf is a community supported non-profit organization that provides food to people in need in the central Vermont communities of Randolph, Braintree, Brookfield, and East Granville.